My special thanks to the Deccan Herald and the Mandetira family. "One morning I came to a temple place known as Kakot Parambu near the town of Virajpet. A holy meadow, called Parambu in the Kodava language and scenic for its greenery, stretches over a hillock within a gateway and is visible from the road. Before it stands a school ground and a ceremony hall. At one side within the precincts is a small shrine dedicated to Chavundi (Chamundi) while at the other side is the Kakot Achchayya temple. Legend has it that Kakot Achchayya and his sister Kakot Akkavva walked to this place in the ancient times. Kakot Achchayya, also known as Kombu Meeshe (Horn moustache) Achchayya, had a man servant called Kari Kotta to attend to them. They settled down here and a Mahadeva temple was built for them. Over years the Kakot Achchayya shrine came to become known as the Kala Bhairaveshwara temple. The Kala Bhairaveshwara temple has a horse figure representing the Kshetra Pala, guardian of the region, overlooking it. 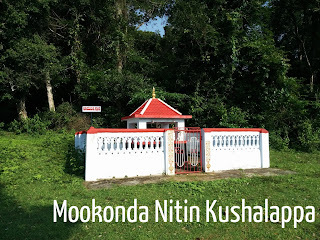 Behind the Kala Bhairaveshwara shrine is the temple of the Kodi Beera (war hero). This smaller shrine is dedicated to an ancestor of the Mandetira family who had died a violent death and who is represented by a rock placed upon a platform. To the side of the main shrine is a large tree upon a platform called the Kari-yappa Sthana. Beyond that is the shrine of Akkavva which has a well nearby. Before the Akkavva shrine is a tree with the small figure of a crane under it. Beside this tree is a temple pond which also has a similar crane figurine by its steps. The Mandetira family is the Deva Takka of the temple. Deva Thakka family members are caretakers who are responsible for the management of a temple. According to their family tree, the earliest known Mandetira ancestor is one Bogayya. His son Achchunna was the brother-in-law of Utta Nayaka of Kadnur, a very powerful chieftain in the 1780s. Achchunna went into Tulu naad (Dakshina Kannada) and sent an archak (Brahmin priest) called Sankana from that land. Sankana and his descendants, the Kukkemane family, thereafter served as the priests of the Kakot temple. Achchunna never returned, dying in that place. 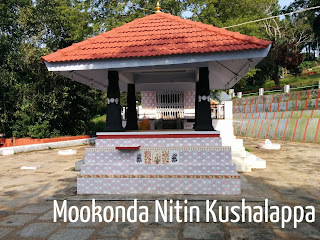 A memorial was built for him there at Kodapada village in Dakshina Kannada. During times of strife and conflict Achchunna's son Medayya was beheaded by a king. A memorial, called the Kodi Bira Sthana, was built for him at the place behind the temple where his head fell. Medayya's young son Subbayya was the last remaining member of his family. His widowed mother, who was from the Iychettira family, brought him up. Upon coming of age Subbayya joined the Raja's government and was given his family property. A painting, which shows him paying the Raja his respects, was commissioned in 1805. Subbayya remained in the government of the Kodagu Rajas for a long while, serving under Dodda Vira Rajendra (r.1792-1807), Devammaji (r.1807-1809), Linga Rajendra (r.1809-1820) and Chikka Vira Rajendra (r.1820-1834). When the British took over the administration of Kodagu in 1834, the native officers were all retained. Unlike his father Medayya who had antagonised the ruling power of his times, Subbayya had remained loyal to the Rajas and later to the British under whom he came to earn a medallion and pension for three generations. He later retired as Parupatyagara, a senior government official. Much of the family history has been documented by the clan members. 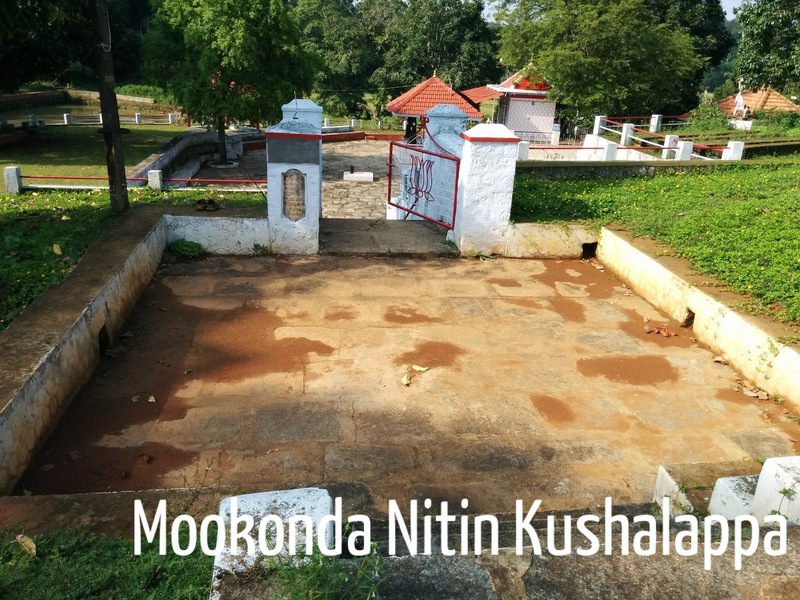 The Mandetira, the Kukkemane, the Nellamakkada and a number of other families have helped renovate the temple over generations. Every year ceremonial dances are held in the Kakot Parambu mand (village green). In 2007, the Mandetira family organised the annual Kodava Hockey tournament which was held in Kakot Parambu that year. The Ainmane, ancestral home, of the clan has a wooden portico and entrance wall. A family tree of the Mandetiras is displayed by the entrance. The beautiful, but small and old, painting depicting the Kodagu Raja Dodda Vira Rajendra (r.1792-1807) and the ancestor Mandetira Subbayya is within a wooden frame placed on the wall behind the hanging prayer lamp. 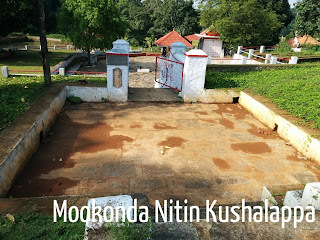 The Kaimada, a private shrine built in remembrance of clan ancestors, and a sanctuary for El Koot Murthy (seven spirit-deities) are located nearby. During my visit, preparations for the naming ceremony of Mr. Vinyas' child were going on in the ceremony hall by the road. Mandetira Vinyas is the son of a clan elder Mr. Nanjappa. Mr. Anil, another family member, showed me around the place." The Ammandira are the first Deva Thakka of the temple. The temple has been maintained by the families of the Nalkeri hamlet of Kakot Parambu, like the Ammandira, the Mandetira and many others. The Mandetira are the second Deva Thakka of the Kala Bhairaveshwara temple at Kakot Parambu. In 1999 Mandetira S. Uthappa had released a book called 'Mandetira family history'. The story of Kakot Achchayya, Kakot Akkavva and Kari-yanna Kotta is from the Pattole Palame. The mentioned family names of the Nellamakkada, the Kukkemane and the Mandetira are on the basis of the stone tableaux upon the walls of the temple which speak of the donations they made to the shrine.